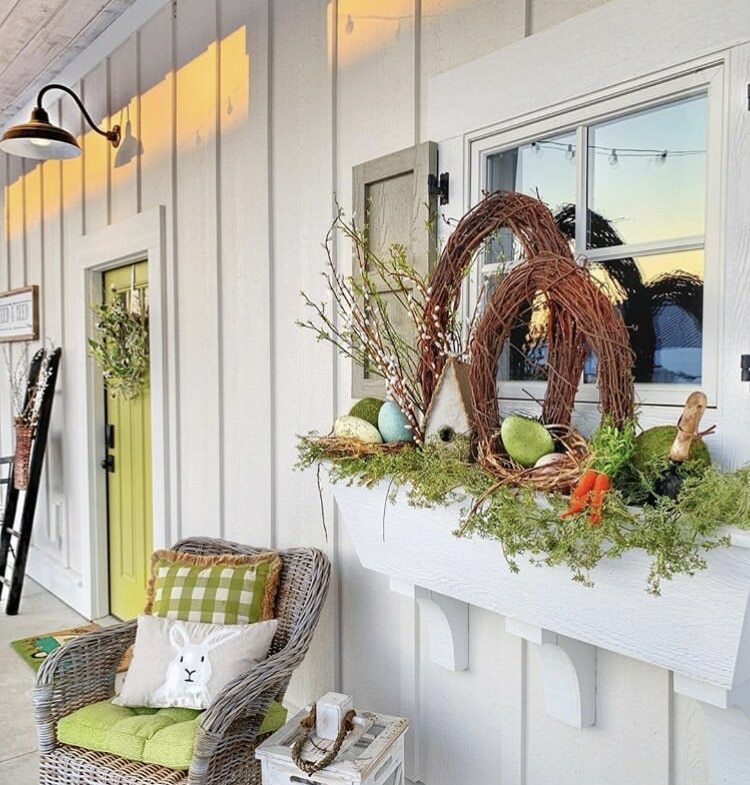 Spring front porch decorating ideas are something everyone is looking for inspiration on. We have gathered together several friends and their lovely porches. 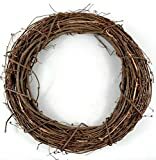 From their wreaths to their precious Easter decor, we think you’ll love them all. It might not be warm outside yet, but we’re ready for Spring! Sometimes just adding some new decor to your home can warm you from the inside out. 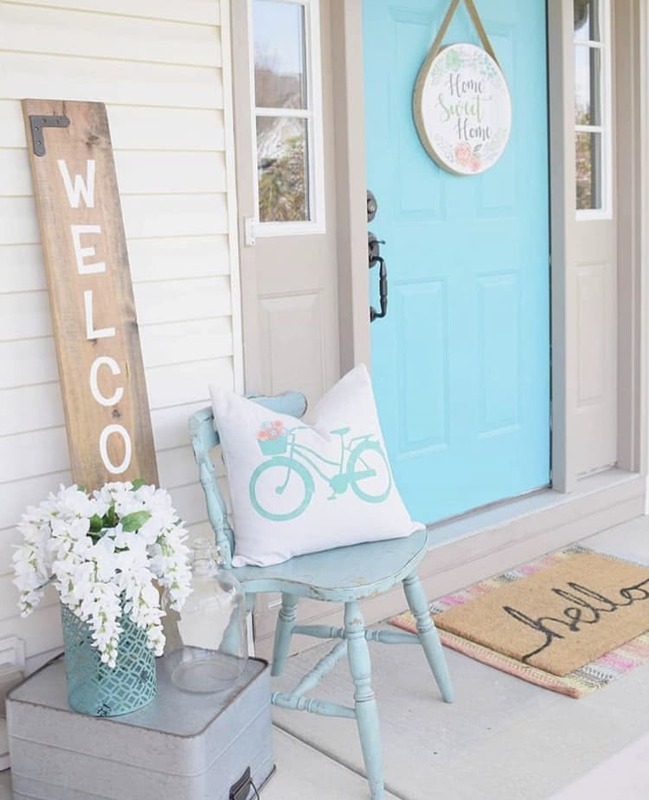 So, here are some wonderful spring front porch decorating ideas we’ve gathered together for you! 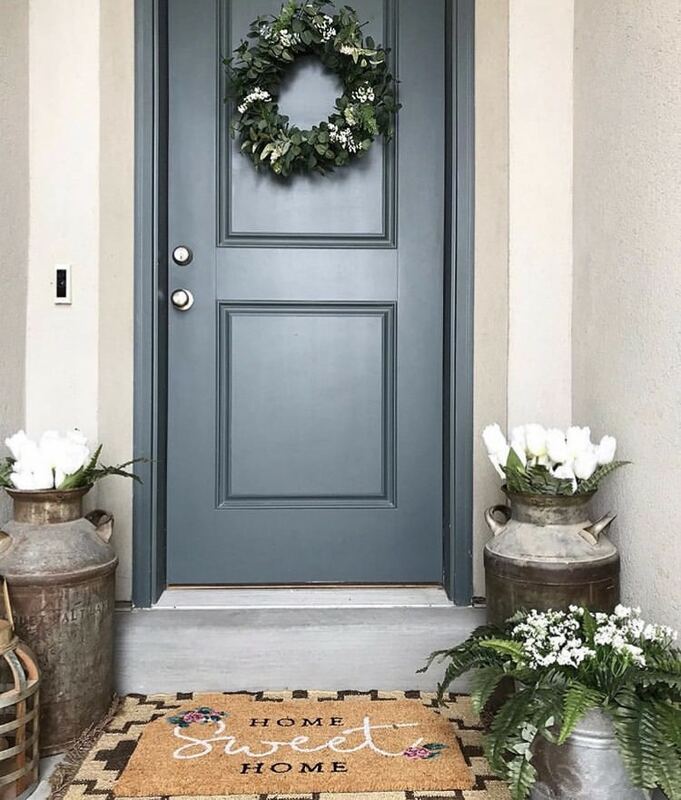 The turquoise on this front porch from the door to the chair to the planter make our hearts skip a beat! 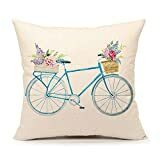 A bicycle pillow and white wisteria scream perfect spring day. 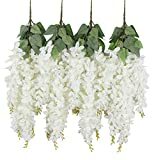 Duovlo Silk Wisteria Flower Artificial 2.13 Feet Hanging Wisteria Vine Fake Flower Bush String Home Party Wedding Decoration,Pack of 4?White? Tracy has decorated her window box with colorful Easter eggs, carrots, grapevine wreaths and a sweet birdhouse. Her buffalo check pillow nuzzled in her wicker chair with a bunny pillow is super welcoming. The rectangle bunny wreaths you see on Kimberly’s porch, she made herself. Her moss covered eggs are cute in her planters. And did you spy the little grey bunny? Doesn’t he look sweet! The Easter Bunny will be to be so happy he hopped by Jen’s home. All of her carrot decor will be eye candy to him for sure. 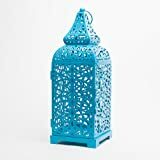 Her small topiaries and lanterns are so trendy to decorate your porch with. 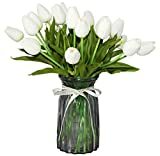 Look at the vintage milk jugs with tulips in them! They encompass everything that is farmhouse spring! This little stoop porch is welcoming to guests that walk up to knock on the door. 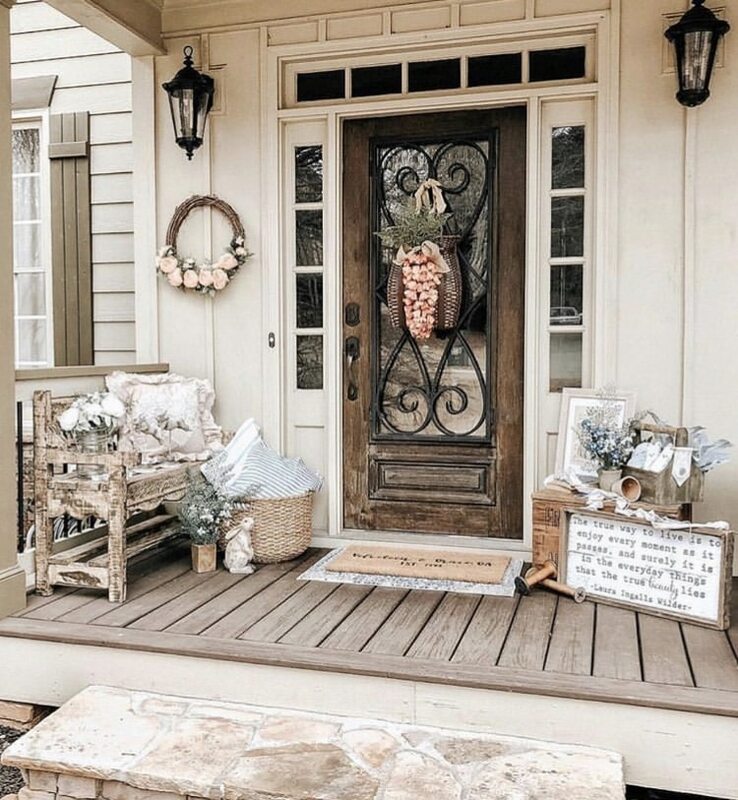 The look of this front porch is shabby chic and spring ready. There are subtle hints of Easter with bunnies and a carrot door hanger. Chippy wood pieces add character and charm to this porch. Staci’s front porch takes you away on a jungle tour. 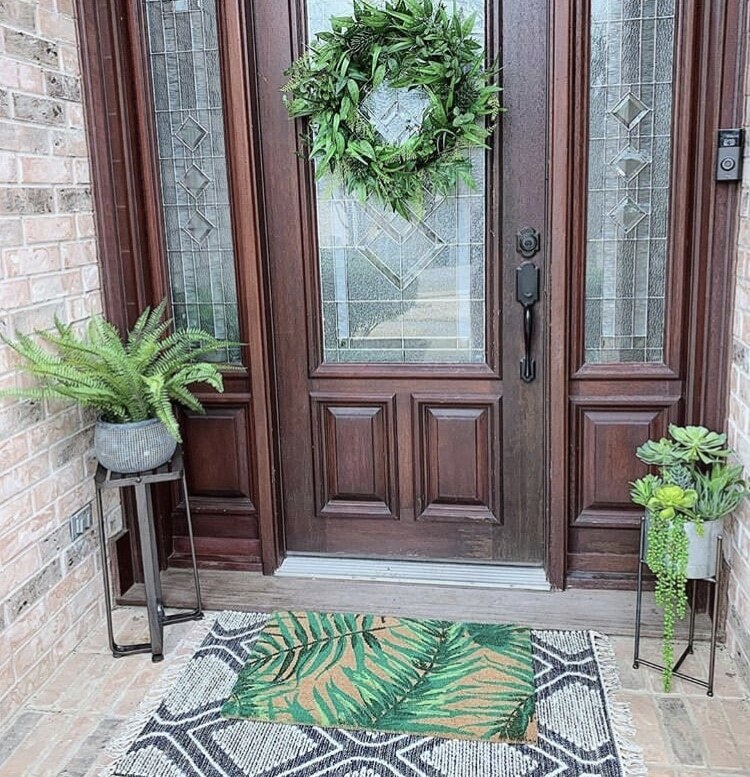 The ferns and succulents are perfect for a spring front porch. Her stacked rugs are the perfect accents to this stoop. 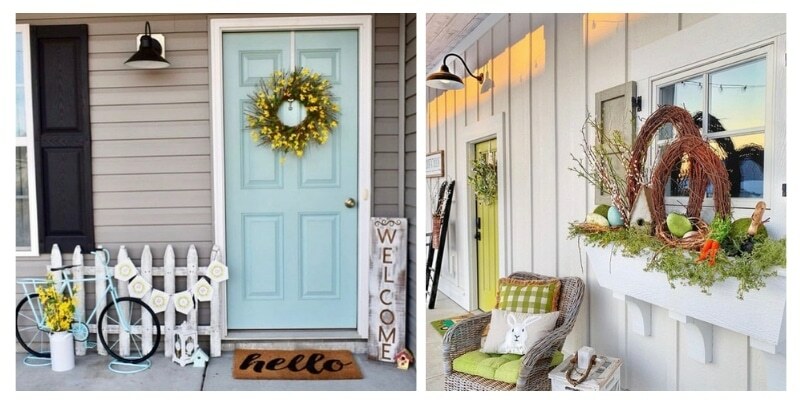 We talk about doing so in our Small Front Porch Decorating Ideas post. Hello sky blue and sunshiny yellow. 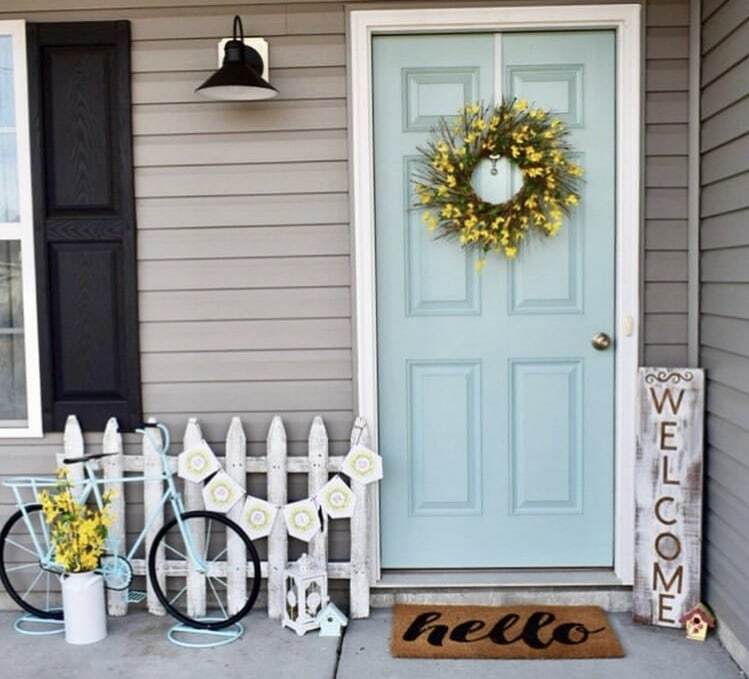 This color scheme gives excellent ideas for front porch decorating ideas. 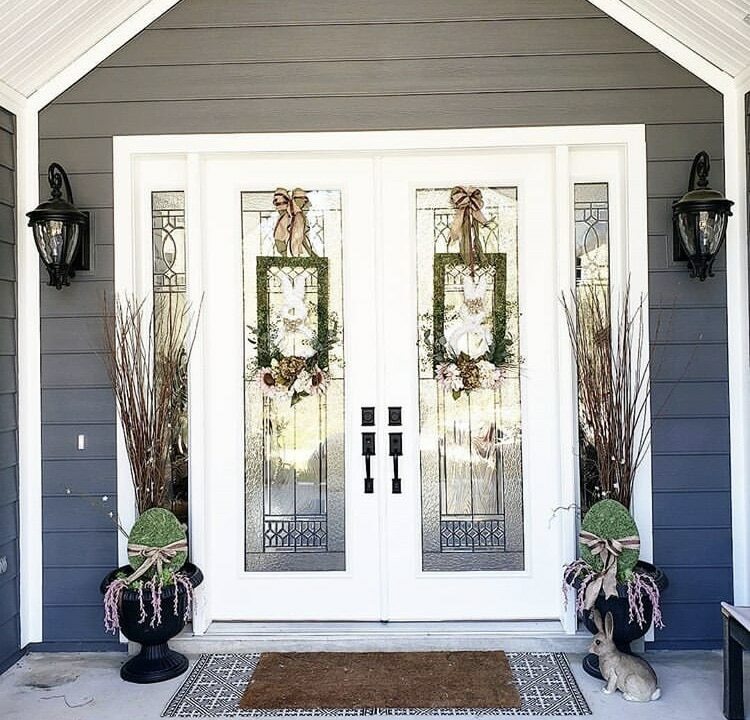 Matching your decor to the color of your front door makes decorations pop. Adding a small picket fence is a precious thought. Shandi’s rustic ladder is perfect on this porch! 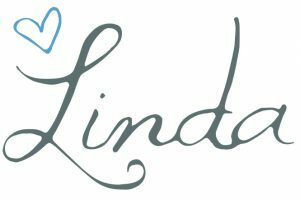 She also has a fun hobby of making custom signs and made the address sign herself! 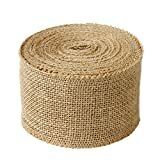 Her hobby is laid out in her Etsy shop SawdustNMascarraSgnCo. 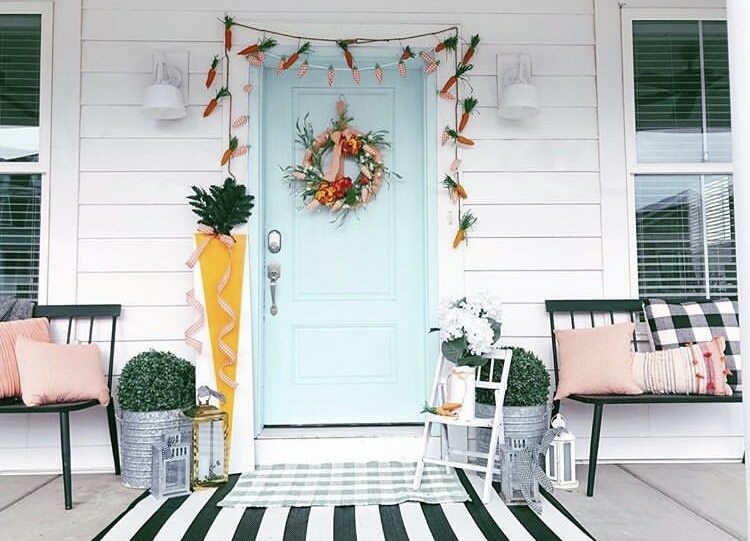 We have more ideas on our post Spring Porch Decorating Ideas. 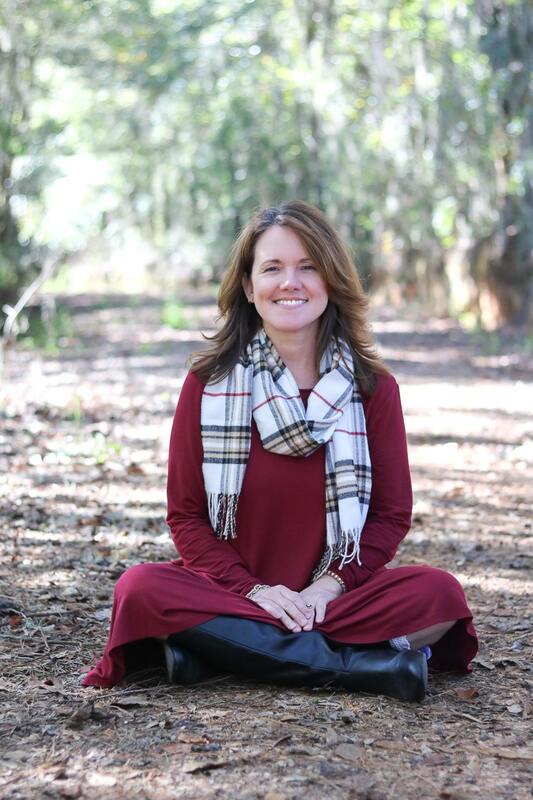 You won’t want to miss the touch of Rae Dunn we have featured. 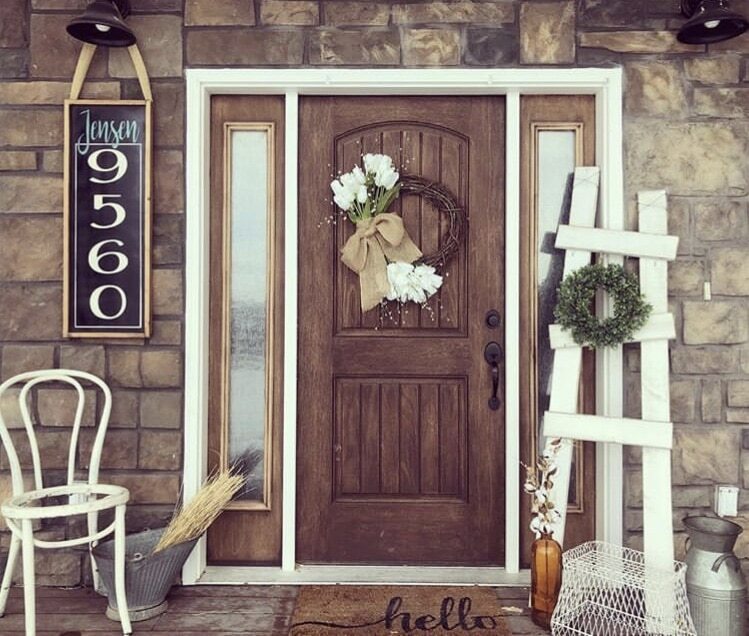 Show us your spring front porch once you have it all decorated!